Thirty years ago, this antiques collector unknowingly bought a $150 dispenser for $4. Now he has more than 100,000 of them. About 30 years ago, Walt Cranford spotted a Pinocchio PEZ dispenser in a local flea market and bought it for $4. He remembered eating the candies as a kid, and tapping into that nostalgia made him feel good. But it wasn't until he discovered that his $4 purchase was actually worth $150 that he decided to become a collector. "I started purchasing any older PEZ that I could find in my travels," he said. Today, Cranford's bounty contains more than 100,000 PEZ dispensers, which he keeps in his store, Newton Antiques & Collectibles, and in a few storage facilities. While wall-to-wall PEZ dispensers are sure crowd-pleasers, Cranford said he gets more out of his fandom than watching his customers' jaws drop; he's made friends along the way, which he said, makes being a PEZhead well worth it. How do you show your love for PEZ every day? I have fun showing my collection (the older dispensers are displayed in a special room) to customers, and I also give a free PEZ dispenser and candy to all kids that come into my shop. I also suscribe to the fan newsletter, "Pez Collector News." What's your favorite PEZ memorabilia? I have a lot of signs and posters of different PEZ conventions from all over the world and special dispensers made for those conventions. I like how well they display in my PEZ room. All of the boxed sets are very collectible, and they display well. Over the years, especially in the '70s, PEZ made a couple series that had eraser-type heads called "soft heads." They are expensive and hard to find. What's the craziest thing you've done for PEZ? I have driven at least five hours to PEZ conventions, most of the ones that I attended were in Myrtle Beach, S.C. and Raleigh, N.C. In all, I have attended 13 conventions. What's your favorite flavor of PEZ candies? I like raspberry and chocolate. They're the best of all their flavors. What's the nicest thing that PEZ has ever done for you? The editor of "PEZ Collector News" has featured me several times in his newsletter. If you could change one thing about PEZ, what would it be? I wish that PEZ would release or remake newer versions of some of their older dispensers from the '50s and '60s. Have you made any friends through the PEZhead fandom? I have made a lot of friends over the years. I have met and purchased from some of the world's biggest collectors like Silvia Biermayr from Austria and John LaSpina and Richie Belyski from the U.S. They are usually at most of the conventions. One of my best local PEZ collector friends is Jim. I met him about 15 years ago at a local flea market when we both saw some PEZ for sale on a table and went for them at same time. We just looked at each other and said, "So you're the one whose been buying all the PEZ?!" What's the one thing that would make you disloyal to PEZ? I find that collecting PEZ helps keep me young at heart, so therefore, I can't think of anything that would make me be disloyal to them. 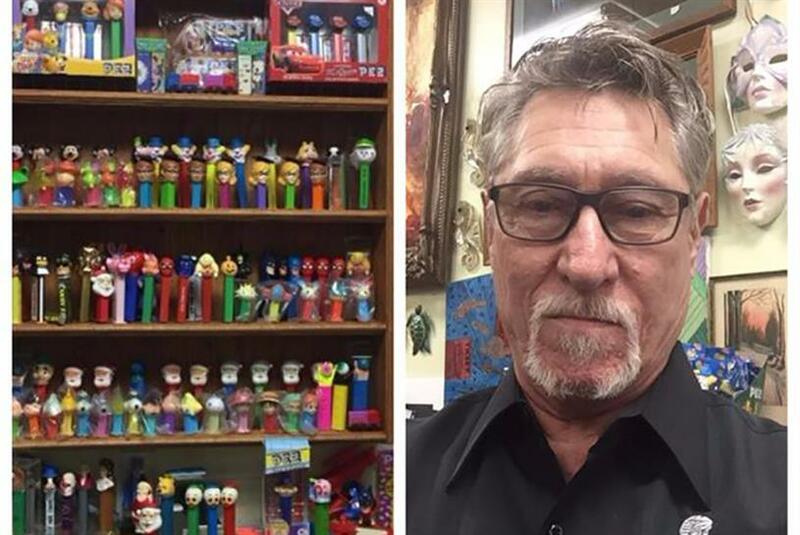 Has your collection ever gotten so big that you've had to sell some of your PEZ dispensers? It's very hard to keep up with all the new PEZ that come out because all collectors are looking for them. To keep up, I have run out of room many times and had to box some up for storage. I have sold a few of my older PEZ, but only if I have multiples of them. I have another collection of World's Fair items that range from the 1870s thru 2015 on display. I also collect antique glass marbles.